You may have noticed as compact and sub-compact crossovers have grown in popularity, so have their prices. I recently tested a popular model, based on an inexpensive car that cost $28,000. That’s without any crash avoidance systems, but with cloth seats and manual climate controls. Only a Bose audio system and power sunroof kept it out of the cellar. If you’re willing to crossover to a sedan, a fully-optioned 2019 Volkswagen Jetta rolls out for less money. It wears a crisp suit, fronted by a grille lifted from the big Atlas crossover and distinguished by chiseled sheetmetal comprising the hood, bodysides and rear flank. It looks especially fetching in Sage Green Metallic paint over 17-in. dark alloy wheels. LED headlamps, driving lights and taillamps equal luxury cars. Look close at the squinty taillights and you’ll see amber turn signals. Classy. It’s a more dynamic look for the Jetta, but it’s still very much a Jetta. Volkswagen interiors had historically been known for their style and quality, but the last generation Jetta contained way too much black plastic. This one hearkens back to earlier models with a tech-laden cabin that embarrasses several luxury cars. Our SEL-grade sedan was lavished with soft dash and door coverings, faux aluminum trim and piano black finishes that feel upscale. Heated and cooled leather seats, sporty steering wheel, dual-zone automatic climate control and large power moonroof back first impressions. Move inside and intuitive technology will make you a believer. Our car came with Volkswagen Virtual Cockpit, which as in Audis, puts a full-width reconfigurable flatscreen in the instrument cluster so drivers can project navigation maps/directions, vehicle stats, range/speedometer or audio settings in front of their faces. I kept in navigation, making it almost as good as a head-up display. To the right is a driver-focused 8-in. touchscreen that can be swiped for radio tuning or browsing music libraries. Proper volume and tuning knobs keep it simple. I still miss the crisp Fender audio system from the last-generation Jetta, but I grew to like the new Beats system very much. Safety tech is ladled on as if the Jetta was a top Audi. Front sensors enable adaptive cruise control, forward collision warning and forward crash mitigation with auto braking. Blind spot warnings, lane keep assist, rear cross path detection, rearview camera, parking sensors and rain-sensing wipers do their parts too. Drive confidently and remain safe. 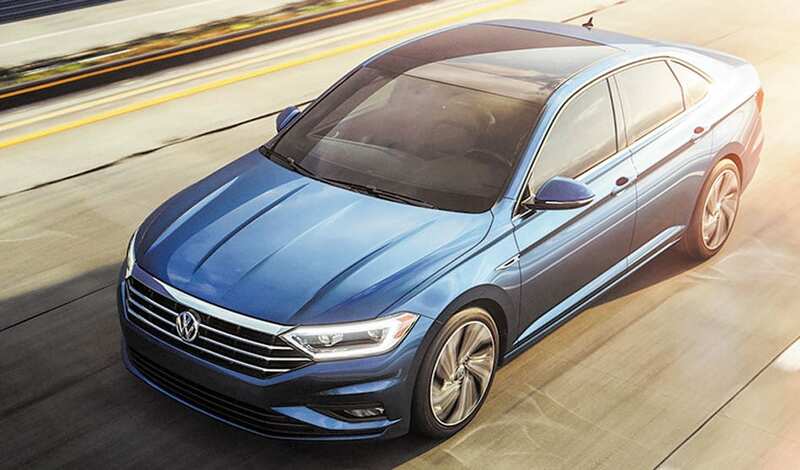 One assumes a GLI version of the Jetta is on the horizon, but for now, even premium versions run with a 1.4-liter turbocharged 4-cylinder engine delivering 147 horsepower and 184 lb-ft. of torque. The Jetta is only front-drive, but shifts crisply through an 8-speed automatic transmission. While it won’t toast sports cars, or even abundantly powered crossovers, it returns a very frugal 30/40-MPG city/highway. You might think a car harboring a small engine that delivers sweet fuel digits wouldn’t be much fun. A quick run from Indianapolis to Pennsylvania and back proved that wrong. It doesn’t have stupid amounts of power, but the turbo and transmission keeps the engine right in its happy place with the turbo’s torque carrying it through hills. The chassis — independent up front, torsion beam out back — is not overly sophisticated but keeps the car planted and unbothered no matter the road. Grippy brakes add confidence at all speeds.